Children from 6 weeks to 36 months are cared for in a separate building know as “The Cottage.” Their needs are decidedly different from older children and change rapidly. Children become toddlers developmentally when they begin to walk. All children go through the same stages of growth, but at different rates. 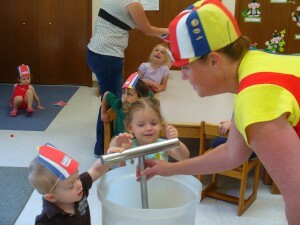 Infant and toddler activities include sensory experiences. We work with infant and toddlers on language acquisition & self help skills, along with fine and gross motor skills. There is a huge focus on cognitive & physical development of young children, especially since they are closely related. Creative and arts expression is also a big part of our toddler’s day. Much time is spent on nurturing and bonding, activities that are vital to the healthy development of a very young child’s self esteem and sense of security. Because we believe bonding is of the utmost importance in a young child’s first three years, we endeavor to keep children with their primary care giver until they are ready for our preschool program. A toddler will be encouraged to make friends with his peers, and begin to try new skills like feeding him or herself and washing his or her hands. We provide special play areas, indoors and out, for toddlers as they explore the surrounding world. Experienced caregivers who focus on the child, interacting in the process of the daily routine to allow each child to develop at their own pace.